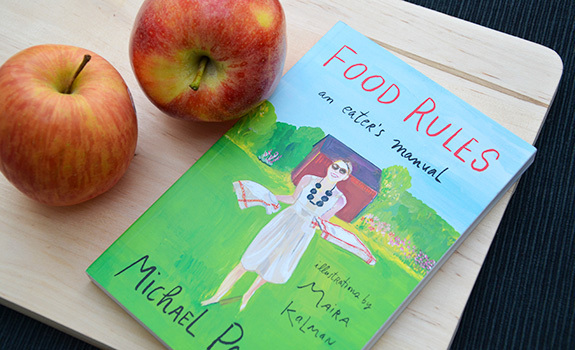 A copy of Michael Pollan’s Food Rules – An Eater’s Manual, suitably paired with apples. It seems that the simpler it’s become to grab a bite to eat, the more complicated the food we eat has become. With single-income families increasingly a thing of the past, cooking healthy, from-scratch meals at home seems like more of a luxury with each passing year. And so we’ve gradually turned into a society that eats frozen burritos, textured soy protein veggie burgers, microwavable entrees, plastic fruit cups and pasta sauce from a jar. The food science argument goes that our great grandparents would have been amazed and delighted by our new world food order, where spending two hours chopping vegetables, trimming meat, dicing onions, and simmering a pot of stew for supper in a hot kitchen is a thing of the past. Not to mention breakfast and lunch. The counter argument is that while there’s never been a time where access to “food” has been easier, there’s also never been an obesity problem like the one we’re currently facing. Author, journalist and food writer Michael Pollan is the fellow behind the oft-quoted line “Don’t eat anything your great grandmother wouldn’t recognize as food” (Rule #2), and Food Rules: An Eater’s Manual contains other similar bits of insight, with another 82 rules that govern a wide-ranging array of food and eating topics. This leads to an obvious question: Why must we have “rules” on how to eat when it’s such a simple, fundamental part of life as a living being? The answer is equally obvious: Because we’ve forgotten what real food is, and by extension what eating is all about. While some are a little more granola than others and a few points are up for debate – the nutritional benefits of organic, say – there are a whole lot of simple, easy to follow rules here that are, at their heart, common sense. Pollan follows that by explicitly stating “No, a Desk is Not a Table.” Tough for me to follow in real life, but I get what he’s saying. Distractions mean we’re not fully paying attention while we’re eating, and this can cause us to needlessly overeat. Hard to control in an office culture where eating is done in front of a monitor, but easier to take charge of at home. I’m taking this on as a personal challenge. Possibly my favourite rule of them all. Consider this before snacking again for the fifth time today. Yeah, this is a strange one to see on NEAROF! (where choco-blasted breakfast cereals are a topic of review, not outright derision), but I like the concept. On one hand, you COULD read the label for the various ingredients you know you probably shouldn’t be eating, or you could just use the resulting shade of the milk as a grassroots litmus test. I’d never thought about this, but I like it. It follows with his general advice to eat mostly plants, and to use meat either as a side dish or a flavouring agent. How often would you eat french fries if you had to make them yourself? Have you ever made french fries at home? I mean from scratch, with potatoes you scrubbed, peeled, cut and fried yourself? It’s a lot of work, and the cleanup is a chore. If you have to put in more effort than slapping down $1.29 at the burger shop, you’ll likely be more thoughtful about your food choice. So beautifully simple, but so often overlooked. As someone who writes about food and encourages people to just get out and cook something instead of pulling up daily at a drive-through, this is a critical rule at the centre of many other rules. If you cook, you’re more aware of what you’re eating, you have more respect for food and you’re more likely to think about what you eat before you eat it. All of these are good things. This edition features fun, whimsical illustrations from artist Maira Kalman that both add a lighter tone to the text and help to add some bulk to the volume. It’s a slender tome as is, and the paintings bring some colour to the plate. If you’d already adopted all these rules before you read the book, good for you. Give yourself a pat on the back while solemnly ingesting an organic kale cookie. More likely, this book will appeal to people who are already somewhat thoughtful about what they eat, and they will see in the book many policies that they already follow, but written down on paper in a way that’s short, sweet and easy to digest. It’s a quick, light read, and there’s plenty of insight here, even if not every recommendation is right for everyone. Cost: $17 (cover price) for the trade paperback edition at Chapters in Calgary. Publisher: Penguin (2013 reissue), 211 print pages. The verdict: Worth reading. Light enough for a summer cottage book, yet offering useful advice without getting too preachy. I love seeing book reviews on Nearof and this book is a great choice! My great-gran’s incomprehension notwithstanding, this sounds like a great book and I’ll definitely check it out – thank you!